The annual Newport Hillclimb has been going on since the early part of the last century. Many famous drivers have competed there and so have I. It's a timed run on an 1800 foot course that eventually places your car at an almost vertical position. Hundreds of antique cars make the pilgrimage every year in October. I have raced up the hill in my 1914 Fronty Speedster for five years and was quite content to cover the course in around 28 seconds. Then I met "Doc" Bowles who had for sale this marvelous Model T racing engine. This is the story of the Modified Model T Speedster that set the all time record at the annual Newport Hillclimb--fastest time in the fastest class ever --22.18 seconds. The car was put together in only a few months and had no interior, paint, or trim when we participated in the Hillclimb. The seat consisted of two cushions from my mother’s rocking chair and I am sure that’s why the car performed so well. The frame, rear axle, wheels, and most of the components were 1927 Ford. The body was purchased in Chickasha, Oklahoma at the big swap meet. The engine is a Gemsa modification of a Gallivan/Rajo Twin Cam. It sports two SR downdraft Winfield carburetors size C, with D bowls and it swings a drilled and counterbalanced B crank. The engine uses a dry sump with a two chambered offy midget oil pump driven off the gear tower. The engine oiling system is separate from the transmission. The side drive is from a Hal and uses an FU 4 American Bosch magneto. Intake and exhaust manifolds are fabricated pieces. Behind the transmission is a new KC Warford auxiliary transmission. The car is basically old school except for oil and brake piping and disc brakes on the rear—no nitrous, no crank triggers, no motorcycle carburetors, just old fashioned power. Coming off the line when the light turned green, after a previous flubbed start, the tires lit up and left a trail of blue smoke all the way up the hill. The second gear change was especially exciting as the tires blazed again. Acceleration was phenomenal and I began to worry that I would be launched at the top of the hill and land in Terre Haute or Evansville. About ¾ of the way up the hill, at its steepest climb, old Henry’s main clutch decided it had enough and gave up the fight. I thought the tires broke loose so I lifted and when I got back on the throttle there was nothing--the engine just raced up. The car coasted to the finish line. Not knowing what went wrong I cursed every component of the piece of crap drive line until I noticed two girls at the time slip station jumping up and down as I approached them. They were screaming above the snort of the twin cam “You beat the record—you beat the record!” After an unceremonious push by the two girls, the car coasted down the return route and we pushed it into the trailer. I need to thank many people who helped make this possible. The genius of “Jiggler Joe” Gemsa must be recognized. He borrowed the patterns for the gallivan/rajo twin cam from Don Lockwood in Chicago in the 1950s and cast an unknown quantity of these twin cam heads. He massaged these heads and designed new cams and with compression ratios around 12.75 to 1 and made them thump with power. “Doc” Bowles from Hopewell, New Jersey, the historically famous sprint car builder and designer, needs to be thanked for keeping this engine safe and allowing me to wrestle it away from him in Jan 2006. Thanks to the crew at Gary Bridge and Iron –Steve, Paul, John, Jim, Jordan, and Roger for coming to my rescue when it was obvious to everyone but me that I could not complete this project on time. These guys busted their buns to complete this car in a few weeks so that we could be off to the races. A special thanks to Steve Truchan of Gary Bridge and Iron. Steve is the world famous guru of offy building and he put the tune on the engine from the winfields to the Bosch mag. As is the custom and requirement of any long drawn out thank you list, a special thanks must go to my wife Marge who allowed me to spend a bushel basket full of money to win a six dollar trophy. On August 25, 2007, just a little more than a month before the 2007 hillclimb, I received a letter from the Newport hillclimb tech committee that said "It has been determined that your vehicle is unsafe to participate in any future hillclimbs in Newport. We are going to be paying extra attention to this modified class as it has gotten away from its original intent and now has become a speed duel that is getting out of hand." 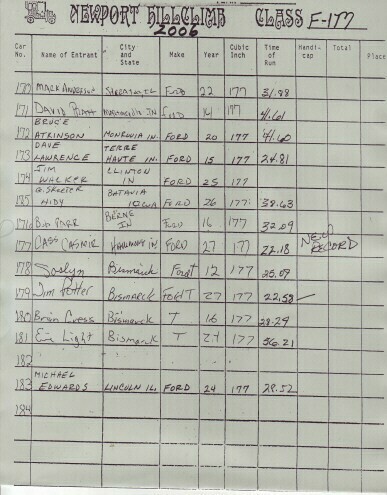 When I went to the hillclimb a few weeks later, I found my record was stripped from me because my Modified T was "too modified for the modified class." I have hired linguistic experts throughout the country as well as two think tanks to help me understand these statements. So far everyone is stumped. However, I still have the trophy, the official time slips, in my mind the record, and as Charlie Yapp, from the "Secrets of Speed" magazine calls it "the fastest Model T in the world." Cass Casmir Jr. of Hammond, IN Owner and Driver sets new record at NEWPORT ANTIQUE AUTO HILL CLIMB. It was a beautiful sunny day in Newport, Indiana with an estimated crowd of 100,000 people. 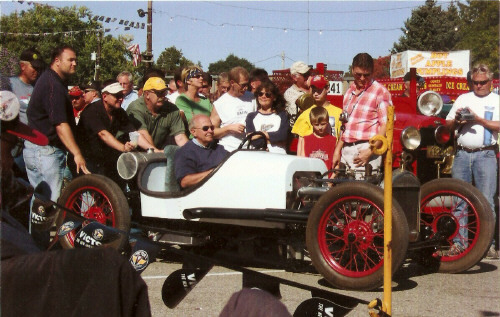 Fans watched as Cass pulled his new “old” experimental Modified Model T to the line for what turned out to be the ride of his life. As the old T roared to life the crowd seemed to know something special was about to happen. Cass revved up his engine, let out the clutch on the old T, and with tires smoking all the way through first gear, shifted to second gear at the Ice Cream Cone on Main Street. 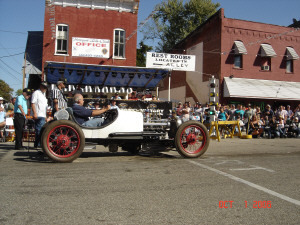 The old T shot up the hill like a rocket to the cheers of the crowd to set a new Modified Model T record at 22.18 seconds for the 1,800 foot run up the hill. This is the only video record we have of the hillclimb. Our official photographer with his state of the art equipment (Cecil B. DeSzany) forgot to push the record button. This video was taken off a camera phone. Turn up the sound on your speakers so that you can hear what a 325 hp Model T sounds like!